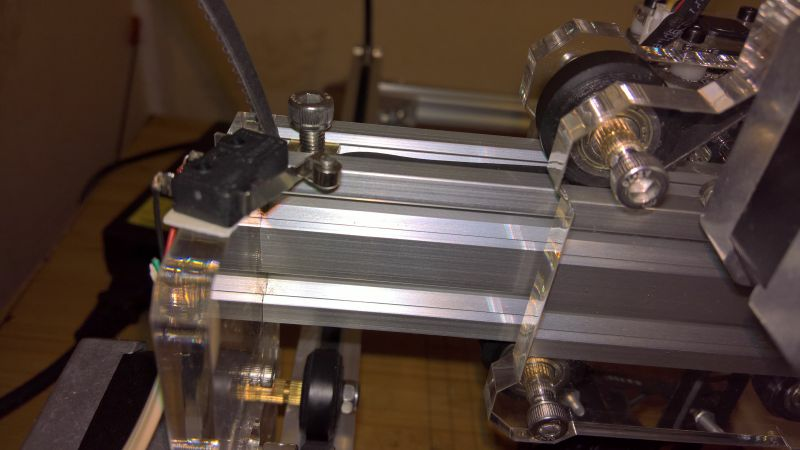 Hi, I have a 2.5 watt laser and have fitted a thermocouple to the side of the heat sink with thermal compound. I can see the temperature rise as I engrave, while testing a job taking about 5 minutes to engrave I measured a temperature of about 45 centigrade (on the heat sink, I assume the laser diode will be hotter) What is the maximum safe temperature before I need to pause the job and let it cool down? I tried to engrave a sheet of glass, about 3 mm thick using a 2.5 watt laser, full power, speed 500. I didn't expect it to work, but it did engrave the glass but on the bottom side even though the laser was focused on the top. The top side is perfectly smooth, but the bottom is quite deeply etched. 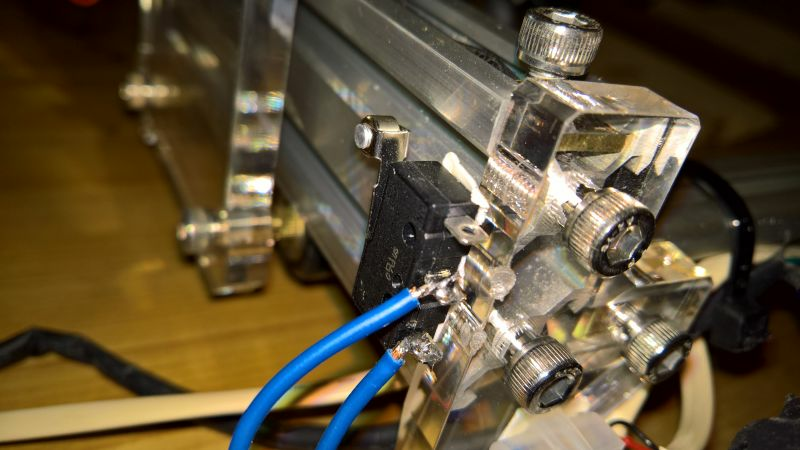 I mounted two microswitches, one on the end of the X axis rail, set so that when the laser mount moves fully to the left it closes the switch, the other on the left front (nearest to the side with the control circuit) set so that when the X axis rail moves to the front it closes that switch. Hi, just playing with my new engraver and T2 laser, I have noticed that if I try to burn a job, in the laser control box, the job is sent, the job is engraved and the laser returns to the home position, but the progress bar shows 100% in the box above it it shows "sending" and the only way co close the box is from the task bar. Am I mising soething obvious?? Ok, thanks for that, I did see it in the menu but wanted to make sure that it was the correct one for using the switches. Sorry if the answer is obvious, but I'm new to the laser scene!